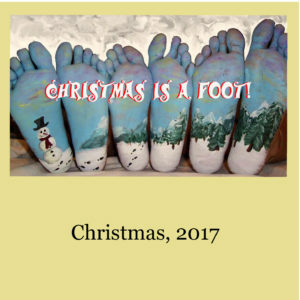 Here’s the link for this year’s Christmas mix, “Christmas Is A Foot”, which includes my demos of both “I Used To Like Christmas” and the as-yet-unreleased “Merry Christmas, There You Go”, and a bunch of other stuff by a whole bunch of other folks, too! Hi Bruce – there is a 2018 compilation, but it never got updated here. I will try to track down both that and the 2017 compilation in the next few weeks. Thanks for the update info on the 2018 and 2017 Christmas Compulation, Please don’t forget me when you have good d/l links set up. I really appreciate your response. I was surprised really. I can see present and past on your web site that your a busy person. I am not rushing you, I just wanted you to know I got your message and I really appreciate you taking time out for me. Just wondering if you ever got the chance to do this update, going over my old e=mails today and thought I would touch base.